Fly the Pattern when others are flying at the same time. … The “race-track” pattern is either “to the right” – Counter-clockwise… or it is “to the left” – Clockwise. … is usually determined by wind direction… taking off and landing into the wind determines the pattern direction. … If NO WIND (like THAT ever happens in Kingman!) ASK the other flyers “which way is the pattern running?” … if you are the only flyer, then you may do as you wish… left or right. Don’t just SAY it… Call ’em out LOUDLY so you know ALL pilots heard you. … and Pilots: Give some acknowledgement… “OK” … “Yup!” … “Ugggh-huh”… “I’m staying high!” … Say something to let that pilot know you heard him. … or yell-back “No – Wait – I am still on the runway” … or “No – Wait – I am dead-stick” … “No – Wait – I AM LANDING.” “No – Wait – I AM ON THE FIELD.”… SAY IT LOUD so you know ALL can hear you. Ask permission to join another flyer. If only one member is flying and you wish to go up, please ask that pilot “Is it OK if I go up with you?”… There are reasons that he may say “No, please wait a couple of minutes, thanks for asking!”; he may be having a hard time controlling his model… he may be making a Maiden Flight and needs an open sky until he gets his model under control… He may prefer to have the sky to himself at that moment… Again… if only one is flying, it’s only polite to ask. If multiple pilots are flying… watch for any “airspace conflict”. Take a moment to assess the situation before “coming out!” See if there is a competition going on (like a pylon race) that you don’t want to pop-up into the middle of. 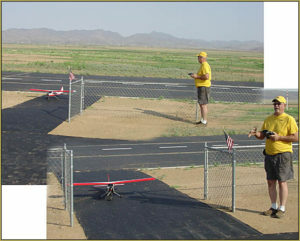 Check out the type of flying taking place and ask yourself if you will feel safe as you fly YOUR model in that mix. … If you are a little uncomfortable with it, then wait a few minutes until conditions seem right… if all the answers are good… then go out and fly! Smoke, Dirt, and Prop-wash! – As you get your model ready to fly, please be mindful of “the big picture” around you. Be aware that your prop-wash may contain dirt and fumes that may blow onto the bystanders (and by-sitters)… and know that, in fact, they may even be allergic to the exhaust! So, be sure to aim your exhaust and prop-wash away from the bystanders… or move your whole set-up to a different bench so as avoid the situation. Keep an eye-out for Full-Scale Aircraft! We all need to be listening for the drone of a full-scale aircraft approaching our area. CALL OUT LOUDLY “Full Scale Aircraft approaching from behind us!”… and, if you are not really sure if there will be any airspace conflict or not, CALL IT OUT… much better to be safe than sorry! … and PILOTS: When you HEAR that call: “Full-Scale!“, drop your altitude. 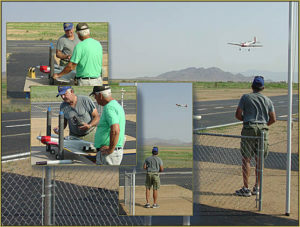 I know that YOU know that no actual aircraft is really going to fly so low as to run into your model… or DO you? … Always bring your model down to a safe, low altitude so that the pilot of the full-scale will have no reason to consider us to be a safety issue. Those are all the points I can think of this evening… If you have more concerns, please leave a comment or send me an email with your ideas. Thank you, all… each and every flyer and spectator. Being polite and being safe… is an unbeatable combination! ← NITRO TRAINER UPDATE: Rick Atkeson enjoys Heavier-than-Foamie experience! Eric, Well written article. Our Club is growing quite rapidly. You review the courtesies and required behaviors necessary for all to enjoy their piloting experience. Experienced pilots, let’s all be certain to encourage safe and courteous habits by leading the way. Another consideration that comes to mind? Removing aircraft from flight stands will encourage pilots to step forward. Once placed on the flight stand, planes should be preflighted and flown. On busy days this courtesy becomes especially beneficial. Let’s use the slow days to get in the habit. Flight stand – fly – table or ground. If you see me do otherwise please feel free to give me a reminder. Great info…communication will keep all of us safe and our aircraft safe too….full scales have control towers for directions or a unicom frequency that the full scale pilot uses to call out their intentions. 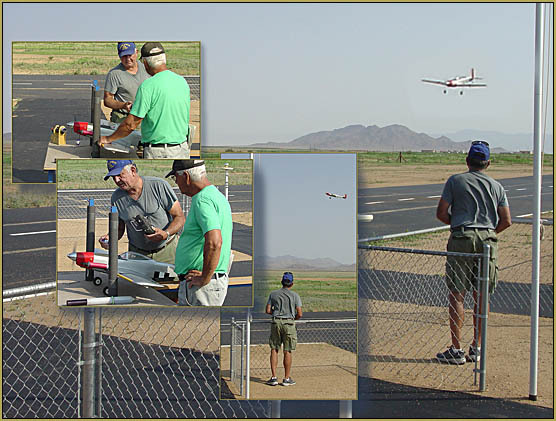 Just one thought to add….using a spotter when the sky is busy will help. 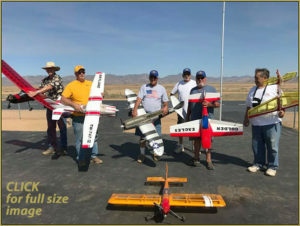 I’m a heli flyer, new to this club and seldom fly around airplanes, I’ve learned from previous RC clubs the two aircraft types just don’t mix well (helies change direction, altitude in unpredictable ways) and its very difficult for us to monitor nearby aircraft while flying. Therefore I have little to no knowledge of the rules and etiquette involved in fixed wing applications, so this very well written article was very informative to me and very timely. Normally I fly alone, or with a couple other heli friends, but I do enjoy getting to hang out with other flyers of all aircraft types. Everyone in this club has been very open and friendly and I am looking forward to meeting all of you and sharing stories. Generally if more than one fixed wing is flying at the field, don’t surprised to se me by myself of in the distance away from the field beating up the air with my helies. That’s how we did it in Michigan at the local club and it worked out just fine. Who knows, maybe I will perk up some interest in flying helies, and some will dust off those old helies and join me! Great article Eric. Great comments from Jon, David, and Rod. In the near future we will be posting at the field two documents. One will address club safety rules and the other will address common curtesy between all our members at the field. 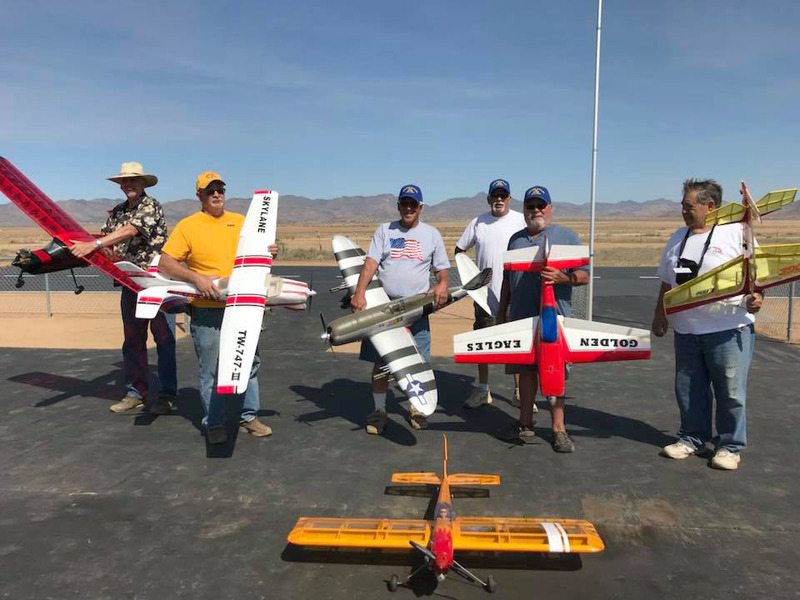 We want to accommodate all types of flyers Sport, Warbird, Drone and Helicopters in a way that we can all get along together and do what our original mission was FLY AND HAVE FUN. After the new documents are posted we will be happy to address any comments relating to these documents from any member of the club.